This would be better described as a test pressing. It appears to be the final Phil Spector produced album. I find is unusual that an acetate/test pressing would come with a finished production sleeve. The sleeve, probably, did not come with the disc. It was likely added by a seller at a later time in order to boost the sale. This disc was auctioned on eBay in February 2004. See the over zealous auction description below the photos. BEATLES Let It Be 1970 DEMO LP!! INCREDIBLE!! ONE OF THE RAREST BEATLES RECORDS EVER!!!!!!! THIS IS ONE OF THE RAREST BEATLES RECORDS EVER TO BE PUT UP FOR SALE!!!! THIS IS A GENIUNE APPLE 'DEMO' LP!!!! FINDING A BEATLES DEMO SINGLE IS VERY VERY RARE - BUT FINDING A 'DEMO' LP IS VIRTUALLY IMPOSSIBLE!!!! 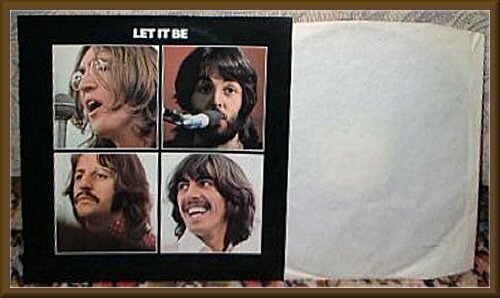 THIS IS A GENIUNE 1970 'LET IT BE' DEMO LP!!!! THIS HAS TO BE ONE OF THE RAREST BEATLES RECORDS EVER!!!! IT IS ALMOST CERTAIN THAT ONLY 10 TO 20 OF THESE WOULD HAVE EVER BEEN PRESSED IF THAT!!!! THIS MEGA RARE DEMO WAS FOR IN EMI IN HOUSE USE - TO TEST THE QUALITY OF THE PRESSING, AND TO GIVE PRIVILEGED MEMBERS OF THE PRESS A CHANCE TO LISTEN TO THE FORTHCOMING BEATLES LP. DONT MISS OUT ON THIS INCREDIBLE ONE OFF OPPORTUNITY TO OWN ONE OF THE RAREST BEATLES RECORDS EVER!!!! On offer here is a MEGA rare LP (especially in this condition!!!!) by The Beatles called "Let It Be" and is an ORIGINAL UK Stereo 'DEMO' pressing!!!! THIS HAS TO BE ONE OF THE RAREST EVER BEATLES RECORDS YOU EVER SEE!!!! DONT MISS OUT!!!! This is an ORIGINAL 'DEMO' Pressing of 'Let It Be' and the main difference to this DEMO pressing and normal pressing is the LABELS, and the MOTHERS & STAMPERS. The DEMO labels are Green & White DEMO labels and they have 'Apple Corps Ltd. 3 Saville Row, London W1' on the top of the labels and 'Custom Recording' at the bottom of the labels. The Albums name 'Let It Be' is hand typed on each label. Not only this but the mothers and stampers are the earliest possible being 1/G & 2/G and the matrix numbers are the VERY earliest being YEX 773-2U & YEX 774-2U!!!! TAKE A LOOK AT THE PICTURES!!!! THIS HAS TO BE ONE OF THE RAREST BEATLES RECORDS EVER!!!! THE CURRENT RECORD COLLECTOR PRICE GUIDE BOOKS ANY APPLE DEMO SINGLE AT £800+ - BUT THIS IS AN APPLE DEMO ALBUM AND IS AT LEAST 10 TIMES RARER THAN AN APPLE DEMO SINGLE - SO MUST BE WORTH MUCH MORE!!!! THIS BEATLES DEMO ALBUM HAS TO BE THE RAREST BEATLES DEMO YOU CAN POSSIBLY GET!!!! IT MUST BE WORTH AN ABSOLUTELY HUGE AMOUNT - AND HAS TO BE THE RAREST BEATLES RECORD TO BE PUT UP FOR SALE THIS YEAR!!!! IN FACT I CANT THINK OF ANY BEATLES RECORD THAT IS AS RARE AS THIS DEMO LP!!!! DONT MISS OUT ON THIS 'ONE-OFF' OPPORTUNITY!!!! 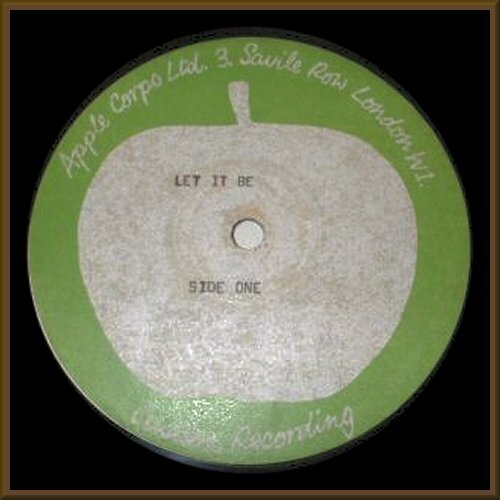 This is the ORIGINAL 1970 Apple DEMO pressing, and is in STUNNING condition!!!! The record is pressed on thick quality vinyl. The Cat. No is PCS 7096 on the Apple DEMO label (see picture) and is a Stereo pressing!!!! DONT MISS OUT!!!! All the tracks are Pure quality Beatles at their best!!!! Any fan of The Beatles, or 60s music in general, will want to have this in their collection - especially in this condition!!!! The MEGA RARE 'DEMO' Apple labels are in STUNNING condition (see pictures) with NO wear, NO writing and only a few light spindle marks!!!! The vinyl is in GREAT condition!!!! THIS CLASSIC LP PLAYS AWESOMELY!!!! Most of these LPs had been to a lot of wild parties and are usually found totally worn out, and almost unplayable. This one is NOT and has NO scratches, only a VERY few light scufflines, and only some very VERY light scuffing only visible under light!!!! THE RECORD RETAINS ALL OF ITS ORIGINAL 'JUST PRESSED' LOOK!!!! ITS AS SIMPLE AS THAT!!!! It is also great to find that the playing of the record is as STUNNING as the visual!!!! It plays with NO pops, NO jumps, NO sticks, and NO nasty constant crackle!!!! This is how I FOUND the record, and I have NOT used any nasty chemicals, or buffing machines to make it look better - it GENIUNELY is this STUNNING!!!! There is NO groovewear either and NO distortion. The record must grade visually Very Good++++ if not better!!!! Believe me this record is NOT overgraded in ANY way!!!! I use STRICT RC grading standards - it is not in my interest not to!!!! Brillant!!!! The record also has its ORIGINAL 'patents' inner sleeve - which is in STUNNING condition!!!! The MEGA RARE EARLIEST Press Cover (with a RED Apple on the back) is in STUNNING condition!!!! It has NO edge wear, NO spinal wear, barely ANY corner wear, only a very VERY few light creases (cover is VERY flat looking) and NO writing!!!! The opening edges are RAZOR straight with NO feathering!!!! The cover must grade FULL Excellent if not better!!!! HAVE A LOOK AT MY PICTURES - I DO MY BEST TO SHOW THE RECORD FROM ALL ANGLES AND MAKE THE PICTURES AS CLEAR AS POSSIBLE - THERE IS NOTHING TO HIDE!!!! It really is a GREAT looking LP and it is truly rare to find any copies of this RARE 'DEMO' LP by The Beatles in this sort of condition!!!! THIS WILL BE YOUR ONLY CHANCE TO BUY AN ORIGINAL GENIUNE 1970 ORIGINAL 'DEMO'' PRESSING OF "LET IT BE" BY THE BEATLES, IN STUNNING CONDITION!!!! DONT MISS THIS LP - THIS IS WITHOUT DOUBT ONE OF THE RAREST BEATLES EVER - YOU WONT EVER GET ANOTHER CHANCE!!! !